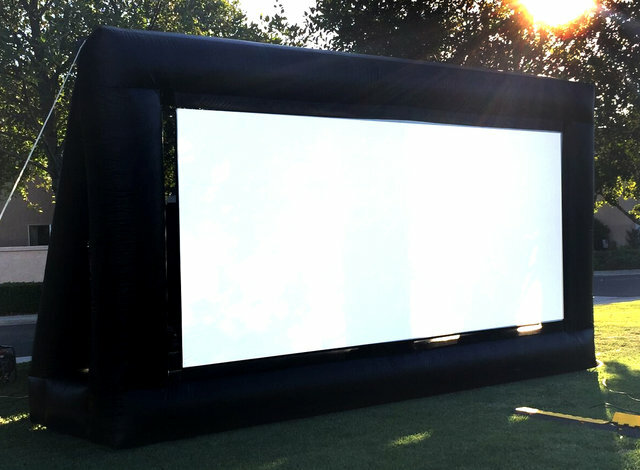 Large Inflatable Movie Screen (includes Screen Only and Blower): Contact us for a quote for a movie night or complete movie package with screen, projector, sound system, power etc. High Quality vinyl build - Unit Size: 18ft x 10ft x 6ft Screen Size: 12x6 (a whopping 160-inches diagonal) Includes blower. Requires a 10 amp outlet within 75 feet. Great for private parties. Watch the fight, big football game, your favorite movie, play video games etc. This item is warehouse pickup only. Unit is small enough to be transported in most vehicles and easy to setup. Contact us for delivery/setup pricing and information .